The most admired city of Madhya Pradesh, Jabalpur is a very beautiful city that sits on the shores of the holy rivers of Narmada. It's a historical city blessed with many palaces and monuments. It's a major tourist destination which captivates tourists with its must see attractions including historical and cultural structures, enchanting Bhedaghat and thrilling Dhuandhar Waterfalls. Spread across the Vindhyan ranges, it's a beautiful paradise for archaeologists and geologists. The Lord Shiva statue at Kachnar City in Jabalpur is a major draw for tourists as the idol is one of the tallest statues of Lord Shiva which is in sitting posture. Apart from these, wildlife lovers may also enjoy holidaying in Jabalpur as there are popular tiger reserves including Pench, Panna, Kanha, and Bandhavgarh, which are located nearby Jabalpur. All these parks are renowned and must see wildlife destinations for tourists visiting Madhya Pradesh. 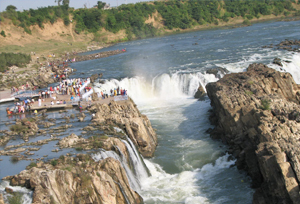 Coming to its history, the rich chronicling legend of Jabalpur is visible in various forts, monuments and temples, which are turned up in different parts of the city and all these have been formed as major tourist attractions of Jabalpur. The name ‘Jabalpur’ unites from the Arabic word ‘Jabal’, which means Mountain and the Sanskrit word ‘Pura’ that means city. Jabalpur is also renowned for housing spiritual leaders like Maharishi Mahesh Yogi and Bhagwaan Shri Rajneesh (Osho). Visit Bhedaghat and take the cable car over the Narmada River to enjoy a bird's eye view of thrilling Dhuandhar Falls and Marble Rocks. 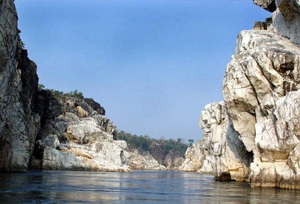 You can relish various natural beauties of Jabalpur and begin your travel with Bhedaghat-Marble Rocks as the place is popular for its solitariness and tranquillity. Wildlife lovers can visit Kanha Kisli National Park to spot tigers and other mammals. One who is looking for peaceful places in Jabalpur may visit the Bargi Dam, Sangram Sagar and Bajnamath, Gwarighat, Tilwaraghat and many more. Enjoy the boat ride at river Narmada in the world renowned Bhedaghat and in Bargi Dam. Devotees may visit the Chausath Yogini Temple, which is dedicated to Lord Shiva. Located between the Bhedaghat and the Dhuandhar Falls on the top of the hill rock, travellers can enjoy the pleasant view of the enchanting Narmada River from the temple or enthral by the beautiful carvings on the walls of the temple. The city has numerous options for accommodation including resorts, hotels, guest houses, and lodges that cater to the needs of all kind of travellers. All the hotels and resorts are well furnished with all modern amenities to meet the requirements of every visitor. The rooms and suites of Jabalpur hotels are tastefully decorated to offer a wonderful holiday. Shopaholics may visit the old Bazaar of Jabalpur where one may find several traditional handicrafts items at reasonable rates. There are shopping malls where one can choose to buy various items like bags, home furnishing items, apparel, jewellery, and many more. Also, don't forget to buy brass ware items, and beautiful Zardosi embroidery, Chanderi and Maheshwari sarees when you're in Jabalpur. A government emporium 'Mrignayani' is also here that offers a huge variety of jute items. By Air: The Jabalpur Airport (Dumna Airport) is the nearest airdrome which is located at the distance of 20 km from the city. By Rail: Jabalpur Railway Station is the nearest railhead to reach the city. There are various trains which ply directly from Jabalpur to various cities like Bhopal, Satna, Delhi, Pune, Patna, Surat, Nagpur, Gwalior, Jamshedpur, Kanpur, and many more. Apart from the Jabalpur railhead, the city also has the Madan Mahal Railway Station and Adhartal Railway Station. By Road: Jabalpur is well connected to Nagpur, Varanasi, Hyderbad, Bhopal, etc., by road. So, tourists may choose to reach Jabalpur by road. NH7, the longest highway in India passes through the city. NH12 also connects Jabalpur to Jaipur and other towns in the state. There are bus services in Madhya Pradesh like MPSRTC and private buses that ply on regular basis from various cities to Jabalpur. Best Time to Visit: October to January is the best time to visit Jabalpur as the temperature during this time ranges between 4°C and 29°C, which are perfect for exploring the city and enjoying outdoor activities.